A kind-hearted teenager in Dubai has managed to collect a truck-full of food items, winter clothing and school supplies for Syrian refugees. Their charity drive, which is in partnership with the Emirates Red Crescent, was a month-long initiative to help Syrian refugees in Lebanon. 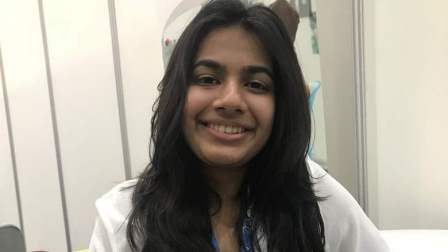 Saher Kapadia, a 16-year-old student at the Raffles World Academy, spoke to Khaleej Times on the sidelines of the Global Education Supplies and Solutions (GESS) summit, where she presented her campaign idea and results to visitors. "There's a whole range of goods that have been collected - there's canned foods, winter clothing and stationery. So, the initiative is already motion and we're almost to the end date," Kapadia said, who received help from some of her teachers to make this campaign possible. "This is our first year of doing it because it took six months to get approval. It's been ongoing for a month and we've already collected a lot. I would love all schools to be part of the drive. The reason why I created this is because I had no outlet to donate, but only through Red Crescent. "We hear so much of 'we'll pray for them', but, that's not enough. If you actually carry out some action, that will help. We can't stop the war but we can still help the refugees and that's our responsibility. We need to help each other. As students, we need to be more emphatic because, in the digital age, we can become so desensitised when we hear about refugees so many times. We need to do something about it, we can't wait for change to happen - we need to do it ourselves." Recent figures by the UNHCR show that there are currently 5.58 million registered Syrian refugees. Civilians in parts of Syria remain volatile situations. Before this campaign, Kapadia was responsible for another initiative, called Happiness Letter Project, where she asked her peers to write thoughtful letters to Syrian refugees. About 10 to 15 students took part and received letters back from some of the refugees. "We wanted students to empathise with the refugees and we wanted to make them happy, that's why we did it. Many of us wrote that we are there for them and that they aren't alone," Kapadia said.